With many different manufacturers offering Stand up Paddleboards across the US it can be hard to pick which is the best. From Multi-million dollar companies to smaller family run businesses everyone wants to get a cut of the fastest growing sport in the world. Paddle boarding is a relaxing yet rigorous activity that will leave you with a smile on your face and an aching body. The ideal trip to take with friends, family, workmates or anyone else who enjoys being around the water! SUP Yoga is also on the rise around the world, another great opportunity to use your paddleboard to improve balance and peace of mind. BIC Sport ACE-TEC Wing Stand Up Paddleboard, Gloss Red/White, 12'6"
Bic is a company that is based in Clichy, France. They are not typically known for making Paddleboards and this is a relatively new venture for the company. Best known for its ballpoint pens which are used in pretty much every country around the world, and have been since 1950 are certainly a reliable manufacturer. With over 17,000 Employees across the globe in over 160 different countries, there’s no reason not to trust this manufacturer! BIC Sport was founded in 1979 starting out with products such as windsurfing gear, surfboards went on sale in 1994 and their first Stand Up Paddleboard went on sale in 2010 and they’ve been making waves on the paddleboard scene ever since. With boards ranging from anywhere between $500 and $2000 BIC now produces paddleboards for all types of SUPers; whether you use your board for Yoga or you’re a professional racer, BIC has got you covered. Only one board has less than a 4-star rating on the Amazon marketplace which proves just how much time the BIC team must have put into designing a durable yet aesthetically pleasing SUP. BIC Sports DURA-TEC original Stand Up Paddleboard- Coming in 5 different colors this board is also available in 5 different sizes (the larger the board the more expensive). The prices range from $500-$750 which is a good price for a reliable SUP! The BIC DURA-TEC also boasts some impressive features such as the polyethylene construction which brings strength and reliability to the board. BIC Sports ACE-TEC performance SUP- This board has been built for experienced paddle boarders and is considerably more expensive than the DURA-TEC for a reason. Costing between $875-$1,150 and two of the models available are even compatible as windsurfs if you want to get more use out of your SUP! Impressive features such as BIC SUP’s exclusive ACE-TEC construction which helps to deliver durability and lightweight performance. Also, the compact 9’2 compact board is perfect for anyone under 150lbs if you are looking for a board which will suit your body type! 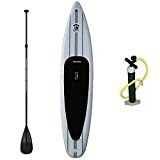 BIC Sports Air inflatable SUP- The first inflatable SUP on our list comes at $600-$1000 depending on which model you choose, there are different models for each type of paddle boarding; SUP Yoga, windsurfing, River and more. There is also an all-round version should you want to use your board for different types of activities. Carrying handles make transporting this board easier to transport also. Surf, Paddle, Explore are the 3 words that Isle use to describe themselves, what started in 2 college kids parents storage unit in 2004 is now one of the biggest board companies around; Offering both Surf and Paddleboards to people across the globe. They also own a retail so in San Diego which is accompanied by their 15,000-foot distribution center. They offer a wide range of different paddleboards and are able to ship across the globe. Prices range anywhere from $600-1200 and come in many different colors, shapes, sizes and have all been made for different types of SUPers! There are some beautiful boards on offer with fantastic designs that would make a great gift for anyone who likes to get on the water and tire themselves out! Isle Surf also tries and persuades people to paddle board socially as if you buy the 2 board combination you’ll get a $400 discount (than if you were to buy them both separately). Paddle boarding with friends/family can be a fun day out where you can re-connect with nature whilst having a rigorous workout that will leave you looking forward to bedtime! Isle Airtech inflatable explorer– There is an 11’ and 10’ model of this board available; the 10’ will cost customers $595 whereas the 11’ board will cost $695. Both of these SUPs received a 4.5 out of 5 rating on Amazon so customers were clearly happy with their purchase. Another very durable board as It was constructed using military grade 6” deep PVC. Another positive is that this board comes with an iSUP accessory bundle. Isle classic Soft top SUP package- Another great SUP which will cost you around $550; coming with an adjustable paddle, center carrying handle and a non-slip deck we’d say this is one of the ideal Paddleboards for people who are new to the scene. Although if you’ve never paddled before we would recommend that you rent a board from a local store and see if you enjoy the activity before forking out over 500 bucks! Isle Versa Epoxy 10’5 SUP- This is the most expensive of the Isle Paddleboards that we’ve listed so far. Again this will come with an accessory bundle (Nylon blade, adjustable paddle, fin and an adjustable paddle) which could save you money later down the line. The Isle Versa Epoxy will set customers back $795 which is about the average price for a high-quality board, especially considering you get a free accessory kit as well. iRocker is an experienced SUP company who have been working around watersports for years. They specialize in inflatable SUPs which are much easier to transport than normal boards. iRocker are trying to persuade people to be more adventurous with their paddleboards and claim that Paddle boarding is “one of the best ways to connect with your soul in a way that cannot be accomplished elsewhere” and we can’t disagree with them! The iRocker team has also come up with the way to turn your SUP into a kayak; if you chose to buy an iRocker board they will come pre-installed with the fittings that make this possible. You can buy the special SUP seat and a kayak paddle on their website for $125 which will allow you to comfortably sit down on your paddle board! This adds extra functionality to all of their boards which can only be a positive. 4 straps and clips, 2 on each side, used to keep the kayak seat secure to your paddle board. Highest quality material used in order to provide the most back support. iRocker 10’x6” inflatable SUP- A high quality and durable SUP that will only cost you $500 is an amazing deal! Gaining a 4 and a half star rating on Amazon and 96% of over 100 customers leaving this Paddleboard a 4 or 5-star rating! This board will come with an adjustable paddle, a high capacity hand pump to help you inflate your Paddleboard. A back carrying pack is also included which makes this the perfect SUP for transportation as it can be simply deflated and put in your bag! iRocker 10’6” long 33” wide SUP package– This is very similar to the other iRocker (above) although there are some major differences. First off this board is 3” wider, but that extra width combined with some other features brings this price up to $150 to $650. So what else will you get the extra cash? Your Paddle will be made of fiberglass which is half the weight of the Aluminum paddle you would receive with the other package, and it can float! You also get a backpack for carrying your SUP and a 2-year warranty with this board. iRocker Inflatable 11-foot long x 6-inch thick- The last iRocker Paddleboard on our list comes in at around $600 so is in the middle of the price bracket when it comes to this SUP manufacturer. Don’t forget that you can buy the iRocker kayak kit and it will be compatible with many of their boards and is a great way to change up the usual activities! There is even the option to buy this board with the Kayak kit that will cost $670 (everything included). Receiving a four and a half star rating this board was clearly loved by users; it comes with an Aluminum adjustable paddle as well as a lightweight hand pump and backpack. So this is another great option for anyone who’s always on the go/has trouble transporting their SUP. Tower paddle boards is a company which made it through the ABC show Shark Tank (if you want to watch it then go to iTunes and search for Shark tank Season 3 episode 9). Mark Cuban invested $150,000 for 30% of the business all the way back in 2012 and the company has since become a trusted SUP manufacturer for customers around the world. With prices ranging from $500 to $1000 and boards in all different shapes, colors and sizes it shouldn’t be difficult to find a Tower Paddleboard that will suit your needs! Tower Paddleboards are based in Southern California when their CEO Stephan Aarstol saw a gap in the SUP market he jumped right in there to bring customers an easy way to improve their fitness and peace of mind. Value is one of the towers main factors, they aim to bring users an affordable yet reliable SUP that can be used on any body of water with ease. Selling inflatable boards also makes it easier for customers to pick the board that’s right for them. TowerPaddle 10’4” iSUP Adventurer 2- The first Tower board we will go over is an inflatable paddle and would normally cost you $1,275 on the Amazon marketplace but is currently on sale for $800 which is a great price for a high-quality board. You will receive a 3 piece Fibreglass Paddle and hand pump with this SUP. Although the outer shell is made of military grade PVC material you also get a 2-year warranty which could ease your nerves. TowerPaddle Adventurer 9’10”- For $100 less you can get the original model of the adventurer; coming in at $700 this board has received unbelievably high ratings with a 4.6 out of 5 average from over 500 users on Amazon. This board is also made of military grade PVC, you’ll get a 3 piece fiberglass paddle and hand pump. So the only major difference between this and the adventurer 2 is the fact that this SUP is slightly smaller, oh and $100 cheaper! TowerPaddle Xplorer 14’ iSup– If you’re a more experienced Paddleboarder and you’re looking for to improve your technique and get a board which will let you paddle to your heart’s content then this could be the right SUP for you! Costings users $1000 this board isn’t cheap and has been specifically designed to improve speed. Ideal for Racing and/or touring as well as your everyday paddles. Extremely durable and comes with a hand pump and adjustable paddle this board can be used by anyone no matter their body type. This company offers many different sups for people of all ages and sizes. They produce their own boards and the prices can range anywhere from $400-$1200. Some of the boards that are available under the Jimmy Styles name have an amazing design that would complement any paddler! All of their boards are extremely durable and come at a competitive price. Jimmy Styks i32 iSup– This is a great board for anyone who’s just coming onto the paddleboard scene. It will set you back $450 but all the needed accessories are included (Fin, Leash, Paddle, Carry case etc) which could save you on any extra costs in the future! Because this is an inflatable paddleboard you can easily deflate it and place it in a bag instead of trying to haul a massive board by yourself. Jimmy Styks Big Bro SUP– Another great board brought to you by Styks comes in 2 different colors, red or wood. Costing between $700 and $850 this board is ideal for more experienced paddlers that are looking to improve their skills. Coming with a JS adjustable paddle, 10’coil leash, Fin hardware a spare vent cap and much more there are many reasons to give this SUP a second look! Jimmy Styks Puffer iSup- Another inflatable board brought to you by Styks that has had 5-star ratings from ALL of its user. This is a rather large paddle board which can be used by anybody (as long as they are under the weight limit of 270lbs). The drop-stitch fabric was used to provide rigidity and reliability to the paddleboard. Tie-downs can be found on the front of the Board, these are a great place to store a water bottle or any other items. 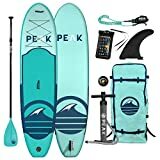 All of the needed accessories come with this SUP, Adjustable paddle, leash, Repair kit a board bag and much more will cost you $509.17 on the Amazon marketplace (yes the board is included in the price). Badfish are a team of watersports enthusiasts who have worked together to try and create the perfect paddleboard. Originating from Salida, Colorado. After owners and former kayak guides, Zack and Mike got bored of sitting down while on the water they decided to switch it up a bit. After years of brainstorming, testing and improvements they believe that they’ve created revolutionary paddleboards that are ideal for moving water. 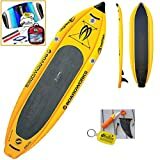 Boardworks Badfisher MCIT 11ft Inflatable SUP Fishing board– This is a truly amazing board and is great for anyone who likes stability whilst they’re paddling. Ideal for fishing this board will cost around $1600 and comes in many different colors. The Badfisher SUP Kit includes a high-pressure hand pump, color matched repair kit, Removable center Fin, XL roller Back-Pack, SUP paddle and much more. Because this SUP is inflatable it can be easily deflated and put into the backpack which comes with the accessory kit. Not only will this make it easier and more comfortable to carry; but it also means that you can take your board to spots that you couldn’t reach before. Badfish 9’0 MVP(mountain valley paddleboard)- Trying to keep balance on running water whilst on a SUP can be difficult enough because of all the obstacles you have to dodge throughout the process. Badfish have designed this board specifically for use on rivers/moving water. This is a great choice for anyone looking to take their SUP adventure to the next level and would usually cost around $1200. If you try to use a board that was designed for flat water on a river you may find yourself floating downstream faster than the board itself. If you live inland and river paddling is the only way you can enjoy the world’s fastest-growing sport then the MVP is a great option! Hole Shot iSup- Another inflatable board brought to you by bad fish, at 32” wide and 11’ long you’ll certainly have enough space to relax and take in nature as you use this board. The average price of this SUP is around $1300 and with the ability to travel on flat water as well as on rivers/any other moving water this is a pretty good all-in-one board. You could even use this as a Surfboard if you wanted to! This is the only board you will need for any future adventures and experienced Paddlers are guaranteed to love using it! If this is your first board we’d recommend either renting a board beforehand or going for a cheaper model as it may be a rather expensive starting point. Especially if you don’t plan to use it more than once a week! With a massive team of paddleboard enthusiasts working constantly to improve the design, features, and ease of use with their boards YOLO are taking massive steps towards creating the perfect SUP. Offering exclusive events meet-ups and much more the YOLO team are really trying to bring the paddle boarding community together. What they like to call the YOLO Tribe has been growing for years and has members all over the world. Every now and then members of the ‘tribe’ will meet up and go on a paddle boarding trip, making new friends and re-connecting with nature at the same time. With some amazing artwork on some of their boards, especially the 10’th anniversary original YOLO which in our opinion has one of the best designs on the market! Prices on their boards range from anywhere between 500 and 1900 dollars. Although most of the boards over $1500 have been specifically made for either racing/touring and are usually sold to experienced paddlers. YOLO iSup mins 11’+adventure kit– The first board we will go over has a beautiful design which would look good under and paddlers feet. YOLO have also included an adventure kit which includes a 3 piece adjustable Paddle, Hand pump, a Fin and a backpack to carry your iSup once it’s been deflated. The board isn’t too expensive at $895, the fact you get free adventure kit will probably save you money in the future. YOLO iSup 12’+adventure kit- This is pretty much identical to the 11’ model, using high-quality marine grade to ensure durability and coming with an adventure kit also. But there is one major difference, this SUP cost’s $100 than its slightly smaller counterpart. Deciding whether or not it’s worth the extra money is up to you, but we’d say that both models are good Paddleboards that come with needed accessories at a competitive price. YOLO Predator 14’– Yet again YOLO have done an amazing job of producing a beautifully designed and purpose-built SUP. The Predator is a high-end paddleboard coming in at $1,885 this is a board for experienced/professional riders who take Paddleboarding very seriously. We wouldn’t advise purchasing this board if you don’t plan to use it more than once or even twice a week as there are other much cheaper boards that would suit your needs. The ideal board for touring can improve your speed and balance instantly, the carbon/epoxy build combined with the specially designed hull makes reaching top speeds possible on the Predator. A company well known for its suitcases/luggage gear has now decided to venture into the worlds fastest growing sport, and have done a good job of it so far. Creating some amazing and affordable new paddleboards Pathfinder have made it much easier for newcomers to enjoy having their own board without breaking the bank! Pathfinder iSup 9’ 9”– has received an average rating of 4.3 out of 5 on Amazon this SUP is a great value option costing users only $350, which may be the cheapest Paddleboard on our list so far. There are multiple layers of PVC to ensure durability, which could ease your nerves when it comes to damaging the product. An accessory kit will also come with your SUP that will include an Aluminum adjustable Paddle, hand pump, a detachable center fin, carry bag and a valve wrench. The carrying bag is great for anyone who is always on the go and/or struggles to carry their Board. Jilong Zray Pathfinder- The Jilong Zray is another great SUP brought to you by Pathfinder; with this board, you will receive an Aluminum Paddle, Inflation pump, carry bag, detachable Fin for $664.87 on Amazon. This SUP also has the ability to be turned into a Kayak by adding a seat. This is the ideal opportunity to switch up your watersports so you don’t get bored of paddling! Larid Standup was started by a surfing enthusiast who discovered Paddleboarding and decided he had to venture into its world. Over the years he has done extensive research into the needs of each type of paddle boarder, and gone on to design a board that should have useful features, be comfortable for everyone no matter their size, and be an affordable option for everyday people. Larid Standup is now an extremely respected and well know SUP brand across the US and are used by professionals every day across the globe. Larid StandUp LXR carbon storm Paddleboard- Larid have done an amazing job of creating a paddleboard that can be used to gain incredible speeds, win tournaments and be comfortable at the same time! The Carbon/PVC construction makes this SUP ultra-lightweight yet still strong enough to take any knocks. The wider tail has been implanted to improve stability and increase the user control when turning the board, again this can contribute to overall speed and help to win professional tournaments should that be what you want out of your SUP! We wouldn’t buy this unless we were either professional racers or Paddleboard Enthusiast as it costs a whopping $2,796 on Amazon which is way out of most people price range when it comes to Paddle Boards. Larid Standup PVC Y/O/R Surrator SUP- Another insane SUP brought to you by larid is again ideal for any serious Paddlers and would fit right into their collection. This board was designed by Larid Hamilton and Terry Chung who have both been in the industry for decades and know everything there is to know about paddleboards. Only intermediate and advanced paddlers should consider buying this $1,992.45 SUP otherwise in our opinion it would be a waste of money. 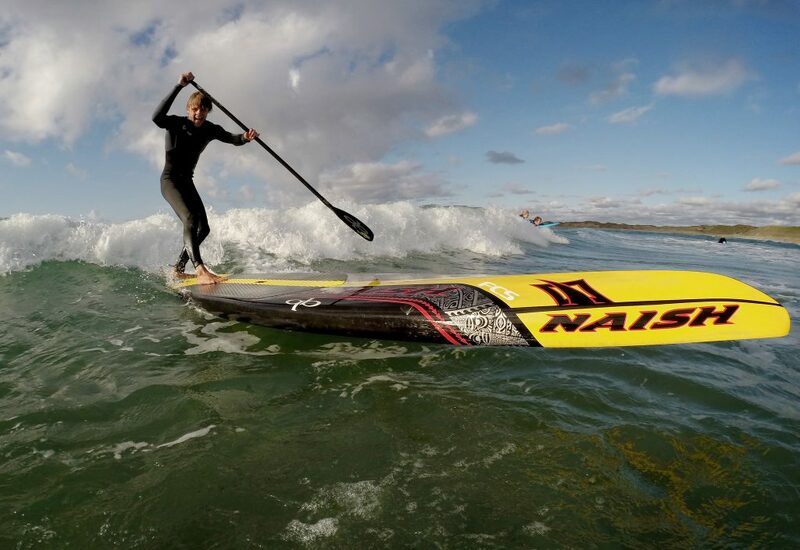 Made for racing and touring this SUP uses rail traction technology to enhance the speed and stability of this board. Again we would only recommend that experienced riders purchase this board; newcomers can get the same experience out of a board that costs much less! Keeper sports are the last SUP manufacturer on our list, but by no means the worst. Producing a wide range of boards with some unique designs there are many reasons to pick a Keeper sports board. Although only one of their boards are available in the Amazon marketplace so you will have to go to their official website to find out more. California Board company Stand up Paddleboard- This SUP is amazing value coming in at $509, the high-density EPS foam makes this board 100% waterproof right to its core. The board comes with the tri-Fin system that will definitely improve your balance whilst paddling. An Adjustable paddle and Leash are also included with the board which could save you on any future purchases. This board is also the first we’ve seen that has a camera mount, so if you want to record you SUP adventure then this is possible with the Keeper Sports board. Users have clearly enjoyed their experience with this board as they’ve given it an average rating of 4.3 out of 5 stars and there are many of the boards left in stock! Anyone paddler from beginner to intermediate could get something out of this board so we’d recommend it to anyone who enjoys Paddling and wants to improve their experience.